St Michael and All Angels creates a newsletter periodically to keep our friends, supporters and followers up-to-date with the activities and events of the congregation. It is delivered via our friends email mailing list. When we try to define what life is we find that it is a very slippery concept, difficult to tie down in objective words. We think we know when something is alive. The very interesting aspect of this is that in the “something” that we think is alive we find the same chemicals that are in things that we think are inanimate. When we consider “What is Life?”, by going back in history to the 17th century we can get an insight into where our scientific view has emerged from. There are very significant differences between Newton’s (1642-1726) ideas of what we call science and our modern (from 1925) ideas of science, especially in the light of quantum mechanics. In Newton’s scientific world view, and to the people of his time, if one wasn’t looking at the moon, there was no ambiguity in believing that the moon was still there. Since the physical senses were the main measurement tools, it was “obvious” that when you looked away from an object that you had just been looking at or measuring it was still there just as you had left it. In modern quantum mechanics, a fundamental principle of gaining information about a system is that the observer plays an essential role and is part of the system of measurement. That means that the system is undefined, i.e. we don’t know what it is doing when it is not being observed, not being measured. In 1943, while residing in Trinity College Dublin, the quantum physicist, Erwin Schrödinger, wrote a book called “What is Life?” He recognised that while living organisms are self-directed and are the product of long periods of evolution, the atoms described by his quantum mechanics blindly followed well-established physical laws. Schrödinger concluded that we would need to develop new concepts which could describe the underlying processes before we could make any progress with the question, “What is Life?”. In 2019 the physicist and cosmologist, Paul Davies, has published a book called “The Demon in the Machine” in which he revisits Schrödinger’s work. He attempts to advance the new concepts that Schrödinger was hinting at. Davies suggests that the underlying concept is “information” which he proposes is an abstract quantity like energy which has the ability to animate matter. He uses the concept of information to shed more light on what is the basis of Life from a scientific viewpoint. How does the Liberal Catholic Church view the question of What is Life? In many ways the LCC supports Schrödinger’s conclusion that new ideas are needed to answer the question and also agrees in principle with Davies’ proposition that information flows are fundamental to establishing life. The LCC world view is that everything changes, nothing stands still and all matter is evolving and interacting “all with all”. Davies’ flow of information is represented in the LCC world as the life force emanating from the Christ imbued at the very heart of all matter. The mathematics that is used in science, physics, quantum mechanics is full of symbols which carry the meaning of the world view of the scientist. In the Liberal Catholic Church we have a deep interest in the symbolism of the Eucharist and the other sacraments, which we use to deepen our understanding of our personal, spiritual evolution and our becoming ever more aligned with the path that leads to union with God. The symbolism that is used in all mystic traditions is often in the form of geometric shapes that appear to be so mundane that they can easily be overlooked by someone without the background information. 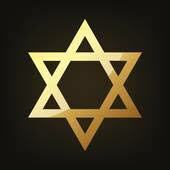 For example, the six-pointed star is constructed with two triangles, one ascending and one descending. In spiritual terms this is God’s love coming down to enrich mankind’s life and mankind aspiring to lift themselves up to God. The physicists and mathematicians who are struggling with defining the most fundamental building blocks of the universe have designated their model as “string theory”. This theory requires 11 dimensions for its full description. Most of us are happy with three spatial dimensions, and perhaps time as a fourth. I think it is interesting that the church’s understanding of the benefit of cooperation of the angels with mankind is equally not visible to human senses but can be too readily dismissed by physicists working with their 11 dimensions! As Easter approaches, we welcome the opportunity that Easter brings for enhanced spiritual growth. 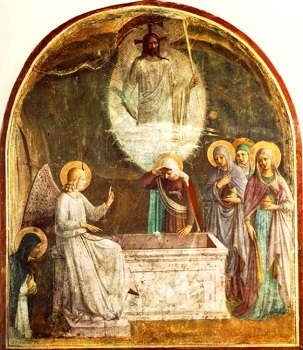 The symbolism of Easter – palms, the cross, the tomb, resurrection provide a reminder to us on the path of spiritual evolution that the experiences which we contemplate at Easter are also a necessary part of our own path to union with God. The first half of our church year unfolds with the major festivals of Christmas (Nativity of our Lord), Baptism of our Lord, the Transfiguration, Candlemas, the Easter festivals and Ascension Day. On the Sunday following the Baptism of Our Lord (3 February) the Festival of Candlemas (the Presentation of Our Lord in the Temple), with its Procession of the Consecrated Host, symbolises and commemorates the coming of Christ into the presence of the Father. On the 13th February we recall and celebrate the 103rd anniversary of the founding of the LCC and special insights and inspiring messages that the founders offered to the Christian world, messages that we can all revisit to gain inspiration. I recommend the LCC “Statement of Principles and Summary of Doctrine” to all members our church as a powerful starting point or opportunity for regalvanising our own journey on the Christian Path. One of our LCC leaders and an inspirational writer was Bp Sten von Krusenstierna. His series of writings on the early influences on Christianity that flow through to our church today is entitled “The Christian Mysteries”. 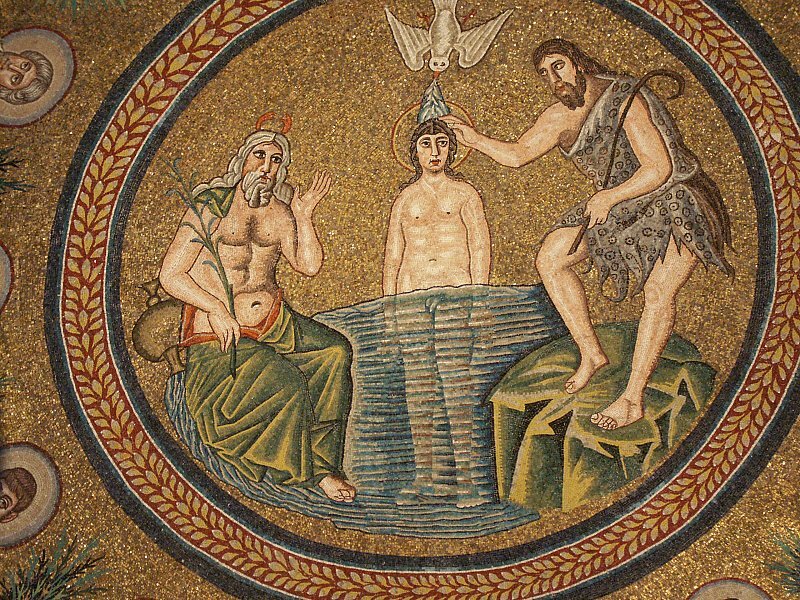 In the section headed “The Liberal Catholic Rite” (p23) Bp Sten writes about the meaning and significance of service of Baptism in our LCC Liturgy and its connection with rites of the ancient Mystery Schools. He gives us a direct and personal insight into the experience of Jesus as he was baptised by John. The procedural details in our Liturgy do not mirror the New Testament description of John’s baptising of Jesus in the Jordon River. In spite of this, the larger picture of Jesus travelling correctly on his spiritual Path and our own entry into the LCC by our personal experience of Baptism are identical in process. 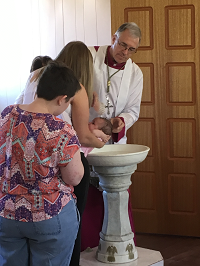 the baptism for infants and children, but all the essential components for an LCC baptism are included. 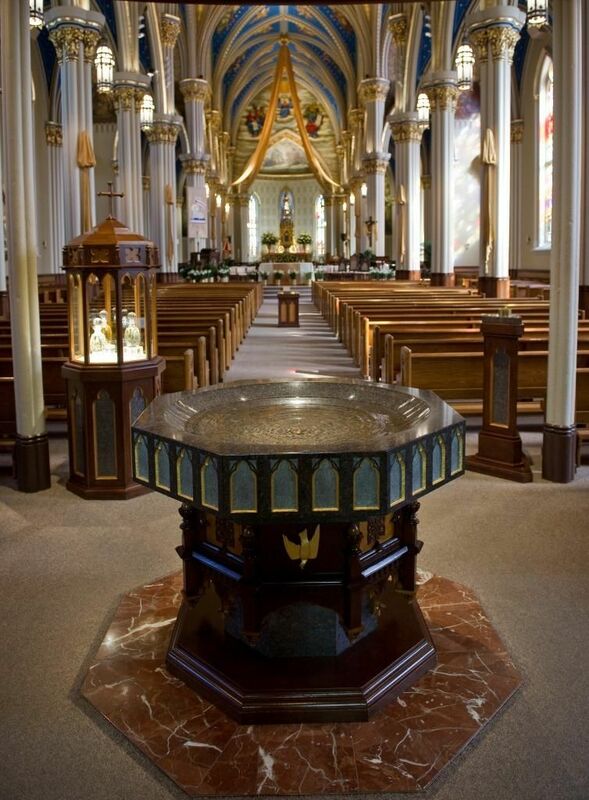 In the LCC we follow the ancient tradition of having the baptismal font at the entrance to the church (the West). This is both a symbolic and an actual reality where the candidate enters the church from the west, is baptised and then journeys towards the East into the body of the church to become part of the “family of Christ” with the existing church members. 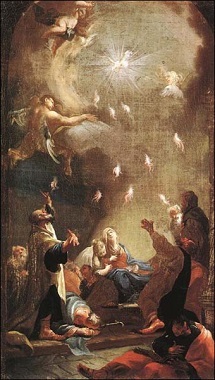 The sequence of spiritual actions that make up the baptism sacrament proceeds with: the Exorcism, which clears and purifies the immediate environment and positively influences the candidate’s body, soul and spirit; activation of the energy centres (sometimes call chakras) using the “oil of catechumens”; invoking of a nature-spirit called a sylph to be a constant and integral part of the candidate, acting as the equivalent of we might think of as a Guardian Angel. At this point all is prepared for the actual baptism which consists of pouring specially prepared baptismal holy water three times over the head and forehead of the candidate. For very small babies this is sometimes a trial as such candidates express differing degrees of enthusiasm to having cold water applied to their heads! To conclude the baptismal sacrament, the energy centre at the top of the head, sometimes called the gateway, is anointed with the “oil of sacred chrism”. Then the baptised “neophyte” is formerly received into the “fellowship of Christ’s holy church” with a small cross on the brow. A white vesture (cloth) and a lighted candle are presented to the neophyte, representing the purity and light of Christ’s blessing enacted through the baptismal ceremony. This is a happy time for friends and family of the candidate to enjoy this special step along the Christian Path enacted in the baptism sacrament. I welcome all who would like to attend and support Cathy on her spiritual journey. The Church year begins in early December with Advent, the time of spiritual preparation for the festival of the Nativity of our Lord (Christmas). 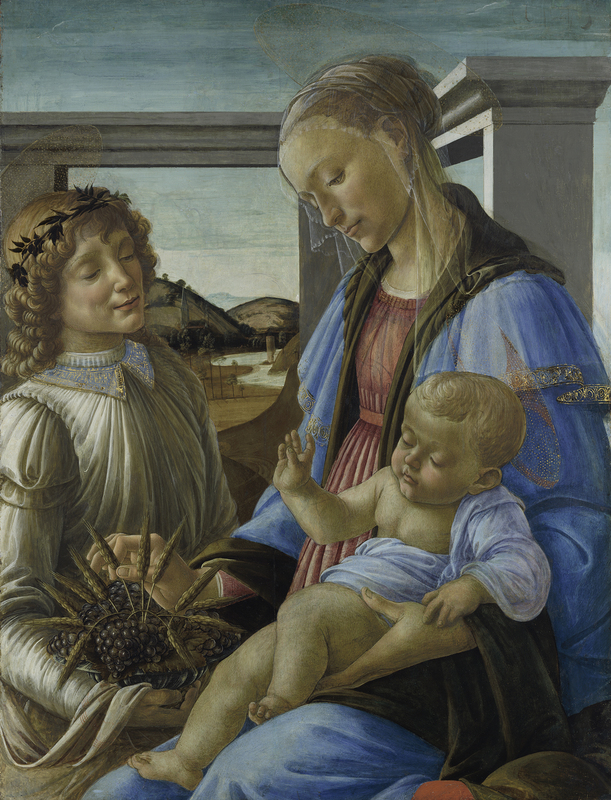 January 1st is traditionally the date for the celebration of the Nativity of Our Lady, or the Solemnity of Mary. This particular celebration is a wonderful way to start the year, and this is a time when we can remember the significant contributions of our church. Not only do we maintain the flame which keeps the Path open for spiritual growth and insights in the Christian tradition, but we also strive to keep fresh through our daily interactions in the community the core guidance given to us by our Lord Jesus Christ. We try to recall at all times that we are an extended community (family) and we need always to find ways to support (love) one another as best we are able. We return now to our reflection of the Lord’s Prayer. In the “Science of the Sacraments” Bishop Leadbeater relates that various sources link the words of the Lord’s Prayer back to Assyrian times, approximately 600 BC. A form of the prayer was known to all Jews and certainly Jesus would have heard it from an early age. The important point that is made by various commentators in reference to the Prayer, and what I would like to emphasise here, is that Jesus has taken an existing prayer and has reinvigorated it with his new message of love and care for our fellows. We can look at three groupings of the lines of the Prayer. The first group of lines uses the word “thy” and addresses God. We recognise that the Trinity exists on all planes but recall that we cannot easily see or conceive the Father. We use poetry to bridge this “knowing” gap. We consciously acknowledge the Divine presence in our lives. into our hearts and on earth. We recognise His intent and action in the world around us, and by aligning ourselves with His will (ethics) we can more readily experience His influence and work with it. The second group of lines uses the word “us” and addresses our community interactions. The bread of love and life which sustains us can be shared with our fellows. This enriches us and encourages us in our daily activities. We don’t expect that the consequences of our negative actions will somehow be taken away, but in order to knot communities together there must be compassion and thoughtful forgiveness. We are “our brother’s keepers” and guidance is always required from the stronger members of the community to the more vulnerable members. This is especially true with the vast array of non-life-affirming attractions readily available to our youth. The third group or lines returns to the use of “thy” and reminds us of the Path to union with God. This reminds us to recall the first group of lines of the Prayer. There is a structure to God’s kingdom, which is mirrored here on earth. There is a Path that we can all journey on in the sure and certain knowledge that this path exists for all time and for all people and leads us to union with the Father. As Advent approaches there is much activity in the community. This time of year brings “end of year” celebrations and events in schools, universities, businesses, parliament and, of course, Christian churches. Advent, which comes at the end of up to 25 Sundays in Trinity, marks the start of the Church’s New Year and was signalled by the “Sunday next before Advent” on 25 November. End of year activities usually encourage us to feel part of our communities, local of more widely spread, and memories of Christmas past often give us a lightness in our steps. The celebrations remind us that we are, actually, part of our communities and are linked in many ways and at many different levels. In 1979 James Lovelock wrote a controversial book on “Gaia Theory” in which he proposed that all organisms (including humans!) interact with their surroundings on Earth to form a self-regulating system which maintains all life on our planet. 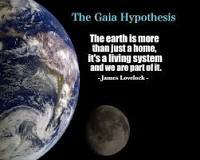 The “Gaia” in Lovelock’s book is the Greek goddess who was the ancestral mother of all life, the primordial Mother goddess. More recently, in 2015 and on a smaller scale, Peter Wohlleben has written “The Hidden Life of Trees”. The author relates how groups of trees use scent to “talk” to one another and take communal action against pests. It is not too big a step to expand this interconnectedness out more broadly to encompass the intent of The Gaia Hypothesis or our mutual community “feel good” reaction to the approach of Christmas. Another form of interconnectedness that most of us interact with (and may even enjoy!) is the internet. This man-made network encompasses the Earth and impacts more and more on our everyday activities and consciousness. 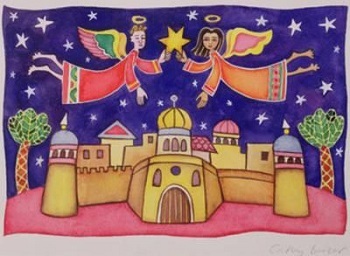 For many of us at our personal levels, as Liberal Catholics, we are aware that we are surrounded by hierarchies of spiritual beings (Angels and others) that interact with one another during their own work and activities and also interact with us when we have the correct means to open ourselves to their work. The “correct means” include our Eucharist and other liturgical practices. In our daily lives we can choose to invoke, to contemplate, to thank these “invisible” helpers, guides and co-creators. One of the most distinctive differences between the man-made internet network and the Angelic network is the reality of the process of evolution. Spiritual evolution, similar to Darwin’s idea of evolution, utilises what is relevant (aligned with God’s intentions) and discards the rest. We are constantly changing, learning and adapting, and we expect that this process is experienced in the Angelic and spiritual realms. The physical internet, on the other hand, needs human intervention for any evolution in the form of maintenance, changes, upgrades and we all know when our internet connections are not operating! During Advent and Christmas, we can enjoy a special time of spiritual blessings which are more intense now than at other times during the year. We can reach out at this special time in our prayers, devotions and meditations and endeavour to align ourselves with our Angelic co-workers and with God’s intent for us in our chosen path. Our human interconnections and the ever-present spiritual and Angelic interconnections can interact, bless one another and evolve into ever increasing harmony and richness. Christmas recreates and commemorates Christ’s bringing a divine energy, force and direction into our physical, visible world. We have started a regular Study Group following our Sunday Eucharist. This is intended for both “newcomers” to the LCC and folk who have been members of the LCC for a while. Over a cup of tea at 10.30am on Sundays we will visit the history, doctrine, teachings, inner workings of the Eucharist, and much more. We would love to see you there and please feel free to invite friends for the discussions. I have recently returned from Europe where my “day job” took me to technical conferences in France and Italy. It was interesting to see European cities which are built for people to cope with cool to cold weather now trying to deal with long hot summers. Our Presiding Archbishop, Graham Wale, and his wife, Kylann, live in the Chateau de Bois Rabot, in the countryside south of Paris. We enjoyed a very pleasant day at the Chateau, which is a property of the LCC and is used as a Training and Meeting Centre for LCC Clergy from all over the world. 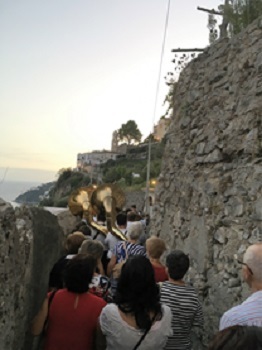 My second conference took me to Italy on the Amalfi Coast. 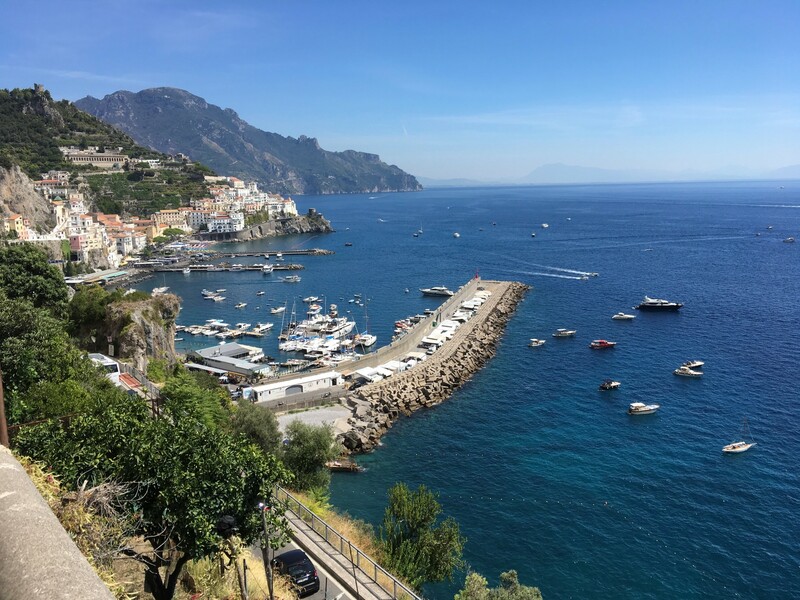 This is one of the most beautiful parts of Europe, and one of the most beautiful coastlines in the world, close to Naples and the Isle of Capri. 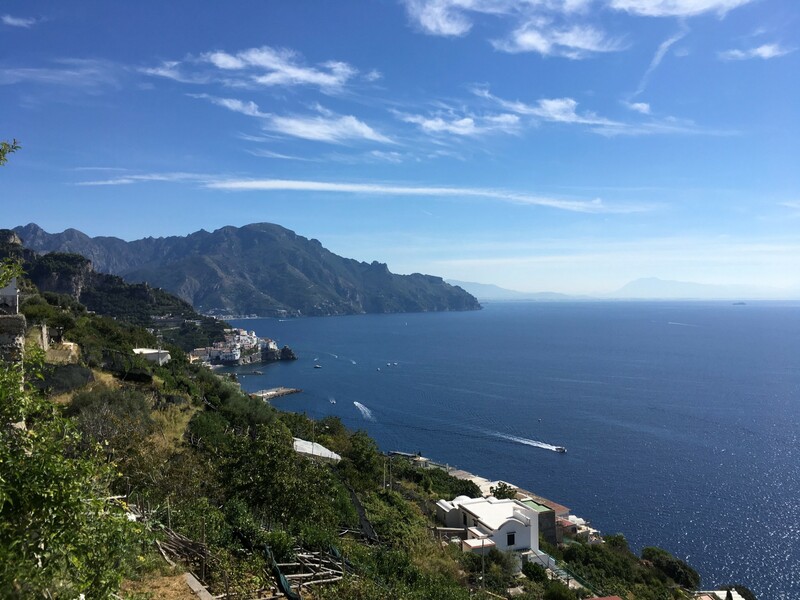 At the Amalfi Coast I had accommodation in two places: one, a nunnery which took in casual visitors, and the other, a whitewashed house in a local village let out for holiday accommodation. In both places I was immersed in the activities of the local community, and I appreciated how central their Roman Catholic activities were to their lives. I took part in the three-day Festival of the Nativity of Our Lady which involved the congregation of the local church next door to my house and much of the surrounding community. 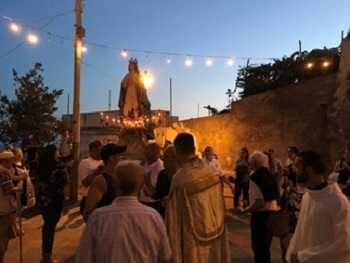 On Friday night the statue of Mary was carried around the church courtyard during Vespers. 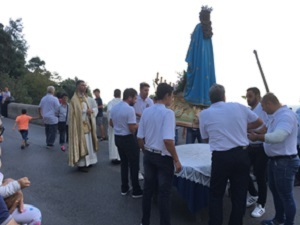 On Saturday she was taken in a procession throughout the whole village with a brass band, the Mayor, and much chanting and singing. 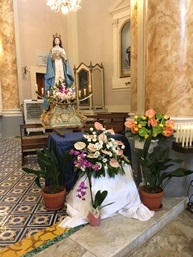 The elderly who couldn’t join the procession came to their doors to touch the statue of Mary. The procession ended with fireworks and dancing. 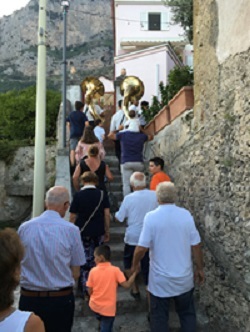 The local churches in this region are separated from one another by a short distance, forming a chain along the length of the Amalfi Coast. Often they are in sight of one another. 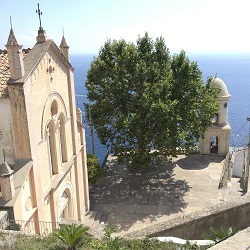 The chain of churches includes a famous cathedral in the town of Amalfi. 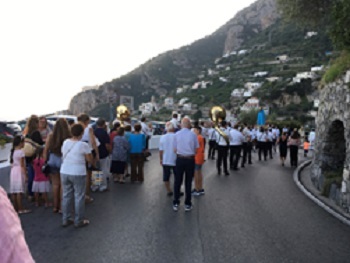 What really affected me, putting aside the differences in world view between this religious community and the Liberal Catholic community, was that the Amalfi communities gain great resilience and strength from the close connection between church and community. As Australians we value our personal independence. But we can all see the difficulties that arise with isolated mothers and children and older people with little or no family support. Limited social connections are detrimental to physical and mental health for all people and the effects exhibit themselves in the short or the long term. Apart from the social issues we see on a daily basis, as Liberal Catholics with a wider world view, we can appreciate, and increasingly come to know, the reality of the deep interconnectedness of all people and all life on the planet on many different levels of our being. The stunning beauty of the Amalfi Coast, when experienced daily, gradually morphs into a “normal” background. This is a consequence of our human process of perception where we are hard-wired to deal mainly with the immediate new “thing”, but the connections we develop and cultivate with all life, visible and invisible, continue to enrich and energise us. The regular interactions with many people and the increasing realisation that the situations and problems of others’ lives are similar to our own should encourage us to be more tolerant and loving with one another. The Intents of Perseverance (21st Trinity), Openness of Mind (24th Trinity) and Endurance (25th Trinity) give us personal wake-ups to recall the important things in life. As we say in the Act of Faith, “…..we know that we do serve Him (God and man) best in service freely given”. Beginning in October, services will be held weekly at St Michael’s. During the next period of the Church year, we progress from the 10th Sunday after Trinity (5 August) with the intent of “Devotion” through to the 17th Sunday after Trinity (23 September) with the intent of “Spiritual Progress”. 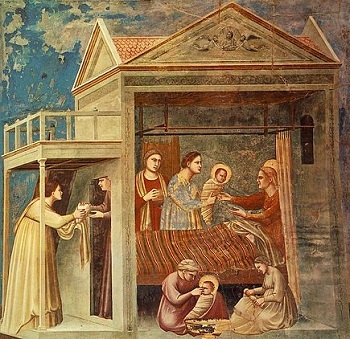 Within this span we include significant events in the spiritual journey of our Lady Mary: the Assumption, the Nativity and Sancta Sophia, also known as Holy Wisdom. 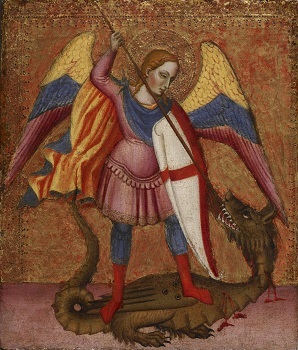 The 17th Sunday after Trinity also includes the Octave of St Michael who is the Patron Saint of our Church. As such we hold a special link with this Archangel who is venerated in Christianity, Judaism and Islam. In our everyday world that we interact with, we place a particular emphasis or focus on being fully rational, based on “the data”, only. In the light of the perspective given to us by Jesus to be “in the world but not of the world”, how might we manage this modern imperative to be “fully data-based rational beings”? For this journey we could start with two related present-day views of how our consciousness functions. The first concept we can consider is our mind/brain/consciousness continuum, the many parts of which function all the time in different ways. Our five senses simultaneously feed data into different parts of the brain which, combined with experience (memory), generate our world view. The huge variety of world views found in people investigated by neurologist researchers such as the late Dr Oliver Sacks (“Awakenings” and “The Man Who Mistook His Wife for a Hat”) gives us a strong sense that “one size” definitely does NOT “fit all”. The second present-day concept to consider is how do we navigate from data to knowledge to wisdom, our “higher faculties”? And more recently, with the advent of robots and Artificial Intelligence, how do we navigate from wisdom to data, via ethics? Most of us have a sense that the physical world, alone, will never supply satisfaction of a lasting, sustainable kind from its own side. We all deal with this dilemma in our own way. The mind is very powerful, and as a vehicle for the ego, the small self, the mind works to limit an individual to only serving the ego. The Real Self, which I will nominate in this narrative as a spiritual-based consciousness, is much larger and more powerful than the mind alone, but is not so easily apparent to us in the day-to-day. A certain region in the physical part of the brain can be understood to manifest the “ego function” and this takes charge of the mind/body complex. This ego function is typically full of fear, self-imposed limits, programming (habits) etc, and if this ego is the only focus, one is usually self-limiting in many ways, tending to link the illusion of physical consumption to happiness. In the West, wresting control from this ego is the basis of our myths and legends, where killing the dragon (the greedy self, represented by the dragon which hoards things it cannot utilise such as enormous quantities of gold, the odd virgin, mountains of jewels) leads to a connection with the Real Self and an understanding of what we are meant to be doing with our lives. For Christianity this distils as serving others on a day-to-day basis, and this “purpose” is the foundation of sustainable human life on this planet. It is necessary to escape the demands of our electronic screens on a regular basis and we need to let the stillness within to intercept the fast external world around us. People these days are missing the “now”. Reconnection with the “now” is not to be confused with “killing the Dragon” of our small self, but it is a necessary step on that journey. In 2010, Marina Abramovic, as the New York MoMA, “Artist in Residence”, took up a commission to create a unique experience for art gallery attendees. The Artist would sit opposite someone while both stared into each other’s eyes. This continued until there was a mutual “conclusion”. Much to everyone’s surprise, every day of the “performance” there were very long queues of people wanting to have the experience of a deep connection with another person. This was living-in-the-now, and this unique experience for those who participated would have opened a new and vitally alive world, perhaps previously unexplored in their busy lives. Life is an experiment for us all and at any time we should be ready to explore and sometimes fail. Our Eucharist provides a reliable link to a wider world and has the function of connecting us to the experience of pure love. At the same time, as coworkers with the Creator, we serve our planet and all who live as part of it. 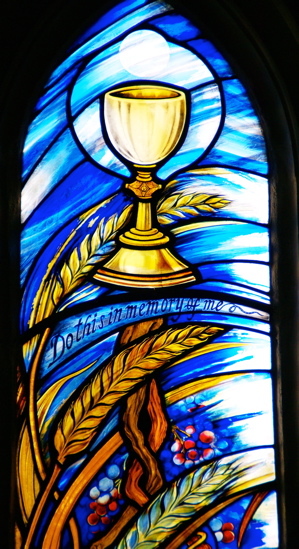 In this way the Eucharist can be seen as Holy Wisdom linked to human wisdom and method. The Sundays in Trinity continue in the month of July. These Sundays all have weekly “intents”, short statements which are offered to us for reflection and to incorporate into our meditations. An overarching theme that underpins the Church year is that of spiritual growth of all participants in the Christian traditions. We might term this process “spiritual evolution” and I would like to share some thoughts on this theme with you now. Darwin’s book, “The Origin of Species”, was published in 1859. We can all imagine the impact that it had on the many different groups of people who were active in the Church at that time, and also on people separate from the Church, some of whom may have been engaged in a scientific occupation. The big controversy that Darwin’s book unleashed was, at its heart, whether God created the world (ascertained at that time at about 6000 years ago) and continued to maintain it, as is, or were there “other” forces in nature that produced slow changes in everything that we observe in the material world, including humans, these changes being labelled “evolution”. This particular controversy does not raise much excitement in the present day, given the massive increase in scientific activity and the influence of science in our everyday lives, and also the very significant decrease in public attendance at church or acknowledgement of religion and God. I am not at all suggesting that science and church attendance are mutually opposed. There are many and varied influences in modern life that lead to declining church attendance. Today the controversies we debate publicly are the building of walls between peoples (eg the US and Mexico), immigration all over the world, terrorism and military threats and invasions. The Liberal Catholic Church has as part of its teachings and general understanding the concept that the whole universe and everything in it is changing and evolving under a plan orchestrated by God. This rather bold statement, by being so brief leaves out all the interesting detail of the role of humans, science, cause and effect, leading a satisfying and useful life, and so on. 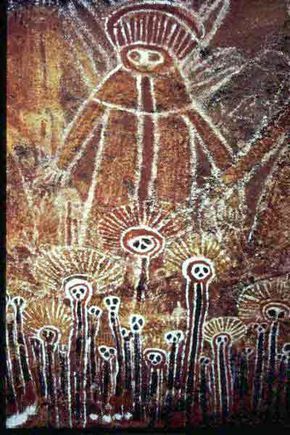 In particular, this statement leaves out the complimentary teaching that the vast array of angels (also called Devas or “the shining ones”) assist with God’s plan of evolution by responding to the Divine Will and directing currents of evolutionary force through all the universe. One of the expressions of this Divine Will is the energy released by the Christ during the Consecration, which is part of the Eucharist, in which the angels play a vital role. 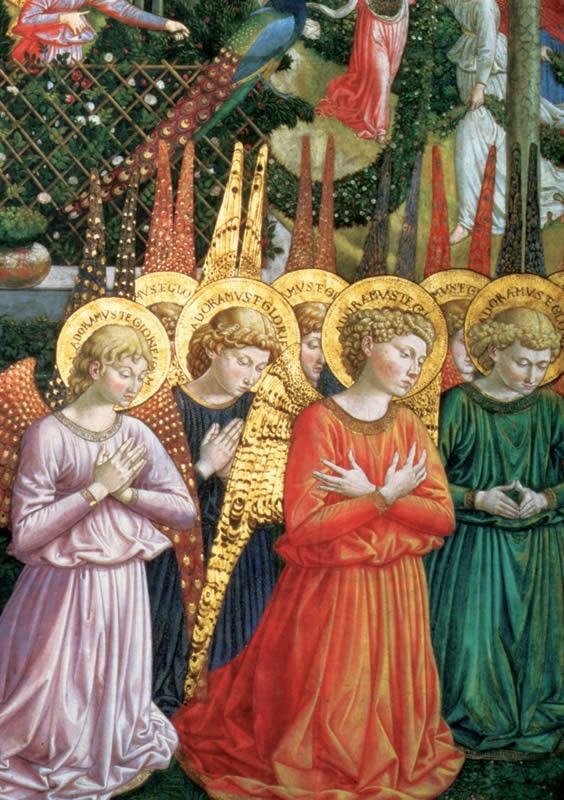 During the Liberal Catholic Church Eucharist, as part of the Preface which begins the Prayer of Consecration, we recognise nine orders of angels as “Angels and Archangels, Thrones, Dominations, Princedoms, Virtues, Powers, Cherubim and Seraphim”. 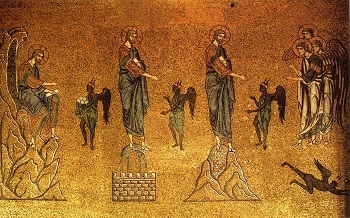 We have an expectation that these angels act in a coordinated way and willingly cooperate with the Celebrant and all the participants of the Eucharist to channel the release of Christ’s blessing which consecrates, uplifts and knits together the prayers, emotions, thoughts and song of the Eucharist. The Intent of the 5th Sunday after Trinity is “God as Peace”. 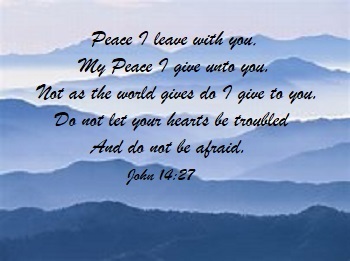 Part of the Gospel appointed for this Sunday comes from St John and reads, “Peace I leave with you, my peace I give unto you; not as the world giveth, give I unto you”. This passage is a reminder to us that truly enduring peace that leads to a life of honest significance and contribution comes from inner sources of power and strength. These inner sources are inextricably linked to the Divine Will driving the evolutionary processes of which we are all a part. Recalling that we can always call on the cooperation and assistance of the hosts of angels in our journeys should give us a spring in our step, and on the not-so-good days, encouragement to smile and rejoice. 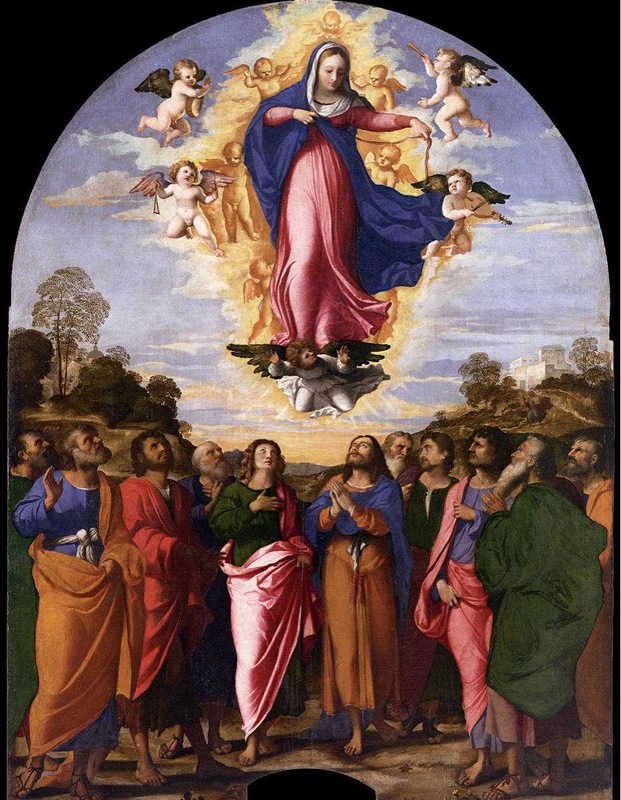 Some of these events are mentioned and/or described in the New Testament, and when they are recorded, as for example the Ascension and Pentecost, they are recorded from the point of view of the observer. We do not get an insight into the thoughts and feelings of the participants, but we might well guess from our own experiences, meditations and reflections. As some of us may be aware, Stephen Hawking, the well-known theoretical physicist, died recently after leading a most extraordinary life of dealing with a degenerative motor neurone disease. In spite of his disease, he expanded our fundamental understanding of the cosmos and in particular, black holes. Some commentators reflecting on his life use the phrase “A Life of Paradox”. We often need to have a lie down when we get a headache, something that is very real and unpleasant for us at the time. But in Stephen Hawking’s case, once he had had a lie down for whatever reason, his debilitating physical condition was still very much with him when he awoke. Yet he persisted with his work at the leading edge of our understanding of the physical universe. When physicists such as Stephen are pushing the boundaries of human understanding, they typically start with a hypothesis, a thought experiment, and then ask, “Is this possible?”, “What would happen if it were true?”, “How would we know if it were real?”. At this point in the process of developing a new, perhaps radical, view of the Universe, the end goal is unclear, murky, but there is an inner expectation by the physicist that they will “know” when they have reached their goal. This inner “knowing” experienced by the practitioner in the world of secular science and technology is very similar to the gnosis, the “divine” knowing or revelation of the spiritual traveller on the Path. In many ways, if we replace the concept of starting with a “hypothesis[RT2] ” with the concept of starting with “faith”, we find that we are engaging in the same process. In the process of obtaining, or developing or expanding one’s faith, we might also be starting from unclear ideas and concepts, or not even be sure of the first step to take in our journey on the Path. But we can be sure that as small parts of our own personal faith jigsaw puzzle suddenly fit together, we will come to see the world differently, interact with the people we meet every day differently, and travel more light-heartedly on our personal Path. These experiences are our own small Pentecosts, our own experiences of the inner inspiration energised and guided by the Holy Spirit. When considering changes in people’s consciousness, we might recall Timothy Leary, a Harvard University psychology professor who in 1965 experimented and wrote about the effects of synthetic chemicals such as LSD on people’s consciousness. He later became very well known in the counterculture of the 1960s, but in the 1950s similar clinical investigations had been proceeding amongst the psychiatric community where peer-reviewed scholarly papers and international conferences provided the appropriate checks and balances for a serious scientific endeavour in the public interest. That serious endeavour was an investigation of the potential of using consciousness-altering, sometimes called “psychedelic”, chemicals on people to induce what could be described as a mystical experience. This mystical experience could lead on to alleviate depression, break harmful lifetime habits and help palliative patients deal with their impending death. Some contemporary models of human consciousness describe the brain as a hierarchal system with the “corporate executive” at the top maintaining order through the thought and action habits that we build up over our lifetime. We might hypothesise that the “corporate executive” is our ego, our “small self”, which becomes our view of ourself with all the limitations that the ego imposes. When this ego function becomes too rigid, we might experience depression and anxiety. When clinical trials are conducted using carefully administered psychedelic chemicals on people with mental problems such as depression, harmful habits and obsessive behaviours, and the brain’s function is studied using modern scanning methods, it appears that the control and importance of the “corporate exec” function is greatly diminished. At the same time, the individual involved has an intense experience, an internal vision of the barriers between the small self and the universe just melting away. This is followed by the emerging of a new, resilient mental model with none of the previously imagined limits which the ego “self-imposed” on the individual. A rebirth, in effect. 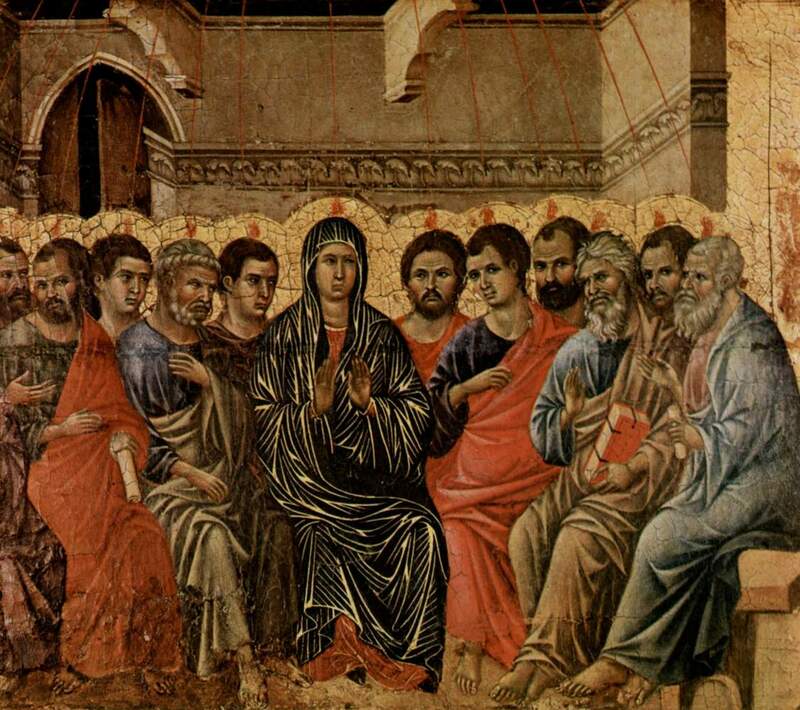 In a similar way, I imagine that the Disciples went through their own personal transformative experiences while being part of and swept up in the original Pentecost in Jerusalem 2000 years ago. They, as individuals, suddenly became different people to their most intimate observers, to their neighbours and friends and family. And significantly, just as people who experience a transcendental vision as a result of ingesting chemicals, the Disciples did not revert to their old habit patterns. Instead we have accounts that their vision and view of the significance and importance of Jesus’ teaching became so clear that they were driven to share their vision with others. They fanned out across the Mediterranean, influencing and changing people’s lives by their example and teaching. For the Disciples, the unreal had become real, and their experience comes through to us in teachings and in the inner structure of the Eucharist. Take any group of Christians and try to get a measure of their faith. You would find a wide variability but we can reflect on two of the gifts that our Founding Bishops bequeathed to us, that is, freedom to explore the written word as we are individually inclined, and the rich structure of the Eucharist. These can help us to discern a sure and certain path towards our own transcendental experience which will bring increasing meaning and deep joy into our lives. Recently I have visited Liberal Catholic churches in Auckland in New Zealand and Sydney in Australia, both churches being dedicated to St Francis. 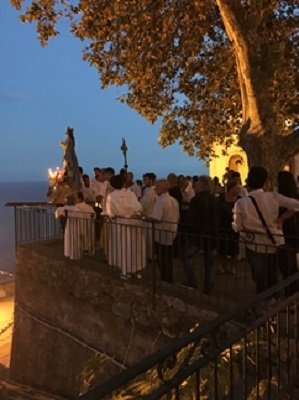 It is a great pleasure for me to be amongst Liberal Catholics in other cities at a Festival time such as Easter and share in communities of Liberal Catholics enjoying our special Christian heritage. I refer to the heritage from our Founding Bishops, as captured so eloquently in the introduction to the Statement of Principles, of “the reality of sacramental grace – with the widest measure of intellectual liberty”. In the thoughts which I shared with the congregations of both St Francis in Auckland and St Francis in Sydney, I reflected on the theme that comes through the recent film of Mary Magdalene of seeking “the Kingdom within” and not the (misinterpreted) Messianic role projected onto Jesus by some of his disciples. Jesus in the role of Messiah was intended to liberate the Jews from their Roman oppressors and simultaneously manifest God’s Kingdom on Earth. This would certainly have been a more momentous event, may I say, than the Commonwealth Games we have been immersed in for the pat 10 days on the Gold Coast! The confusing, difficult, fearful time for the disciples after Jesus’ death was finally set aside by the stupendous event of Pentecost (50th day) or Whitsunday which we will celebrate on the 7th Sunday after Easter, 49 days after Easter Sunday. Referring again to our Statement of Principles, we can see in the sections on “Mysticism and the Wisdom Tradition” and “Theological and Philosophical Background” that the Liberal Catholic Church appreciates insights, learnings and the spiritual traditions of a number of sources reaching back before the time that Jesus taught in Palestine. The Wisdom Tradition is expanded in notes taken by our Vicar General Fr Fred Shade from a series of talks entitled “Partaking in the Christian Mysteries” given by the Rt Rev. Sten von Krusenstierna at the 1988 Annual Retreat in Melbourne. The notes were published in 2000 by the Order of St Alban. Bishop Sten has set out a summary of the Mystery Schools (spiritual centres) that flourished around the Mediterranean in the times of Greek and then Roman dominance. These centres can be shown to have influenced the formation and development of the Sacraments which we practice as Liberal Catholics. The new message of Christ infused the Wisdom Traditions with the Christian spiritual path of purification, illumination and union with God. We personally can use the Festival of Pentecost as a reminder that we too have a spark of the divine fire, the Holy Spirit within us. 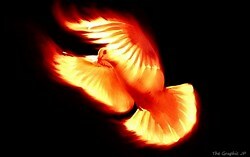 Whenever we sing the Veni Creator we bring ourselves closer to the Holy Spirit. 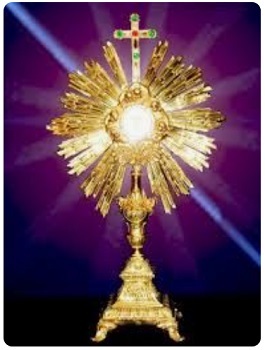 Corpus Christi (body of Christ) too has links to the understandings and insights from the Wisdom Tradition. 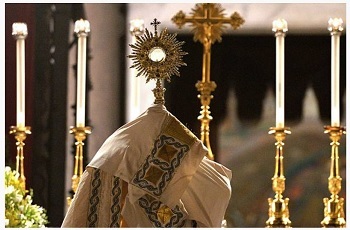 Corpus Christi connects us directly with Christ and reminds us of His deep and ever-present influence in the physical world that we experience with our senses. During the Eucharist, which was initiated by Jesus at the conclusion of his public time on earth, the essence of the second aspect of the Trinity, the Son, infuses and transforms the host and wine at the moment of consecration. 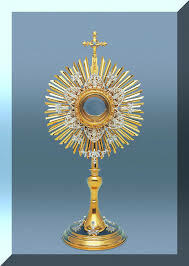 Physically, to our senses, nothing has changed, but at the deeper levels of reality that we are encouraged to explore and understand as Liberal Catholics, the presence of Christ (Corpus Christi) is greatly magnified and concentrated. By partaking of the host during administration of the bread and wine, the Christ penetrates and illuminates us at deep spiritual levels, assisting us on our personal spiritual paths. In these post-Easter days we can reflect on the deeply significant and spiritually precious gifts we can all enjoy. 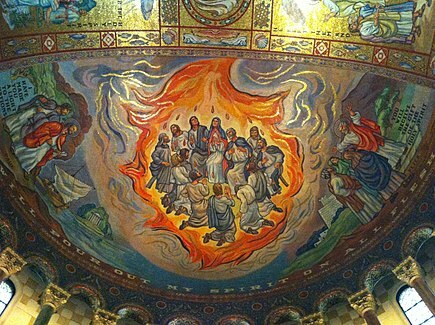 The “fire of God’s love” revealed at Pentecost continues to enrich our lives every day and the deep presence of Christ “behind” the physical world of our senses continues to guide us on our chosen Paths. Bishop Richard will be in New Zealand to celebrate Easter at St Francis in Auckland. 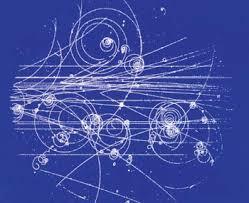 This month celebrates the 50th anniversary of the formulation of the “Standard Model” of particle physics. The “Standard “Model” of particle physics, which was formulated by theoretical scientists and mathematicians 50 years ago, consists of a relatively small number of mathematical formulas and an associated narrative describing the physical meaning of the formulas. The Standard Model enables practitioners to make sense of the picture above from CERN in Switzerland, what happened, how it happened and what would happen if some things were changed. In other words, the Standard Model can predict the behaviour of the tiny building blocks of the material world. This understanding has led onto most of the technology developed in the last and this century, technology which profoundly changes many aspects of all our lives. But not all aspects. The Standard Model is not a great help in predicting human behaviour, what might be the best way to live, what is the meaning of life, and similar “non-material” topics. Approximately 2000 years ago, various writings, many from St Paul, were circulated around the communities that dotted the edge of the Mediterranean from Eqypt to Rome. These “letters” and narratives told of a new spiritual perspective and a new way of living. Those who engaged with this new spiritual view were offered insights into the meaning of life, an inner joy and guidance into living peacefully in their communities. These were the early Christians, the followers of Christ Jesus. 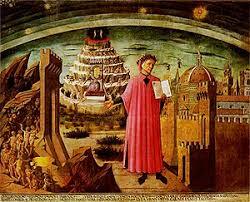 In the thirteenth century, Dante wrote his epic poem entitled “The Divine Comedy”. He is shown in Michelino’s picture above holding his book. Through his poem, Dante set out his “Standard Model”, this time in connection with human behaviour on earth and the many and varied consequences of that behaviour. The Divine Comedy presents the journey of the soul towards God. A little over 100 years ago, our Founding Bishops started a new spiritual “Standard Model” which was a restatement of the concepts in the deep, early roots of Christianity and which was summarised in the Liberal Catholic Church Statement of Principles and Summary of Doctrine. These documents reconnect two aspects of a Christian Spiritual Path that were separated in the early centuries of the Christian era. The two aspects are Christian sacramentalism through the seven traditional rites (Baptism, Confirmation, Holy Eucharist, Absolution, Holy Unction – Healing, Holy Matrimony, Holy Orders) and the esoteric Wisdom Tradition which brings meaning into people’s lives. The Liberal Catholic Church has sought to combine Catholic forms of worship – stately ritual, deep mysticism and witness to the reality of sacramental grace – with the widest measure of intellectual liberty, and respect for the individual conscience. In the power of Christ’s love, we develop that universal tolerance and concern for the wellbeing of others, which is the cornerstone of a true religious life, and without which no system of social organisation can function properly. It leads us to recognise the inherent oneness of all life. We have ethical duties, not only to our fellow human beings, but also to all the realms of nature, which constitute our world environment. Can I strongly suggest that we use this Lenten preparation period, the Passion week and the Festival of Easter for reading, reflecting and trying out the concepts set out by our Founding Bishops. Give their Standard Model an opportunity to bring joy, insights and a life lived with meaning. The “gesima” Sunday’s are preparation for Lent, which begins on Ash Wednesday, Wednesday 14 February. So why prepare for Lent, which is, itself, a preparation for Easter? If we want to modify our behaviour or learn something new or develop and strengthen some aspect of moral fortitude, then thinking about what and where to start is an important first step. Present day psychology informs us that we need enthusiastic emotional involvement in order to seriously tackle making a change in ourselves. Recently I came across an article relaying an interview with Anders Sandburg who works in the “Future of Humanities institute” in Oxford, England. His study area is computational neuroscience, and the topic of the interview was “Should we upgrade our brains?”. The article examined if we should consider “upgrading” our cognitive, emotional and moral aspects of ourselves. When students were asked this question, they thought they would like their attention, alertness and rote memory improved, but not empathy and kindness. Their response was based on their impression that traits such as memory and language ability were somewhat remote from their sense of self, but that emotions such as empathy and kindness were “close to my heart”. Returning to the Lenten/ Easter preparation, this preparation period gives us an opportunity to reflect on and enhance or expand our core spiritual selves. We must feel comfortable with the process, be accepting of the growth and engage in an emotionally committed way for any change to be “grafted inwardly in our hearts”. It should not be an experience that we put on artificially, too quickly, or from a superficially excited emotional state. In these weeks we prepare for the journey of change (the pre-Lenten period), then we begin the process of change (Lent), and through the Easter experience we move closer to being “one with God”. As Liberal Catholics this can be seen as our ultimate goal. The month of January comes packed with Festivals which set out and remind us of the essential experiences of the Spiritual Path. We have the last day in the Octave of the Nativity, the Epiphany (which is linked to the Nativity), the Baptism of Our Lord and the Transfiguration of Our Lord. 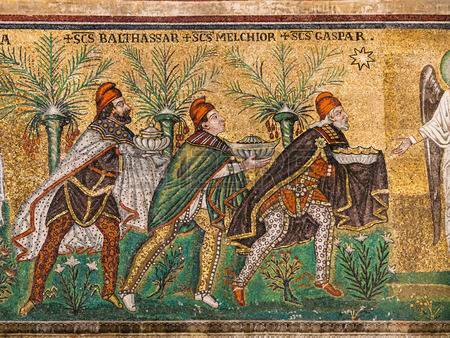 The Epiphany with its colour and splendour celebrates the coming of the wise men, the Magi, from the East. Traditionally we consider them to be three, named Melchior, Balthasar and Gaspar. 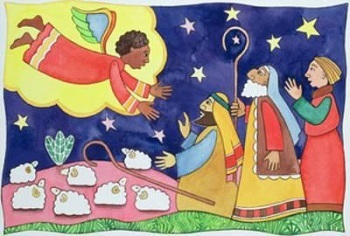 These wise men brought gifts of gold, frankincense and myrrh to the new born Jesus. The symbology of the gifts is worth exploring. We can think of gold as the symbol of a king, or in this case the spiritual leader that Jesus was to become. Frankincense is a perfume, used in church ceremonies for censing to spiritually purify and harmonise the atmosphere, and is synonymous with the entry into the world of a deity. Myrrh is an embalming ointment and symbolises that at the physical level Jesus will die, but reflects that even though we have physical bodies that suffer and die, these physical bodies can carry the source and inspiration of world-changing events. 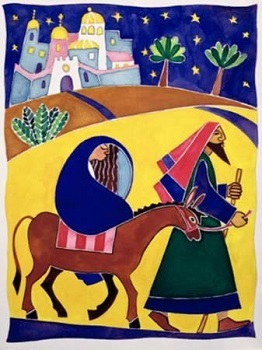 The emphasis that our Founding Bishops placed on the spiritual drama of the Epiphany was that the Magi were not from Jewish heritage or culture, but from outside all the practices that are part of the Jewish tradition. From the first, this new spiritual leader coming into the world was recognised by Gentiles, and the subsequent Christian message developed in Jesus’ lifetime was for all the peoples of the world. The intents and sentiments of our Founding Bishops, which have been carried forward by subsequent Bishops of the Liberal Catholic Church, include the concept of expanding the vision of Christianity to include the ideal of union with God, here and now in this lifetime on earth. Specifically, in the new Liturgy of the Liberal Catholic Church, published in 1917, the intent was that the Eucharist and the Church Ceremonies would be a powerful source of spiritual life and light to the world. Fundamental to these ideas of a larger view of Christian worship was the clear understanding that all members of the Liberal Catholic Church would enjoy an atmosphere of intellectual freedom to experience and explore the church’s ideas and practices. I hope that you are enjoying a happy and peaceful time at the start of 2018 and that this year you have the opportunity to experience at first hand the deep and meaningful message of the Nativity and the birth of Christ in us all. 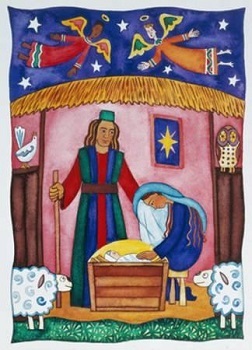 Monday 25 December, The Nativity of our Lord. It may well be that the dominant thought in a lot of people’s minds at this time in December is the bustle to complete the Year’s tasks before Christmas. Maybe December brings a furrowed brow just thinking about it! In contrast to the very necessary and earnest pursuits we are all engaged in, we can also bring to mind that the 3rd December is the first Sunday in Advent, the start of the church year. Advent is a period of preparation, hence the colour violet, which is the colour adopted for spiritual review and re-focussing. We now look towards the 25th December and the Nativity of Our Lord, the first of the significant celebratory festivals in the church calendar. The broad structure of the church year is designed to present the significant stages of the Christian path. The four church festivals, in order on the Spiritual Pilgrim Path, are the Nativity of Our Lord, the Baptism of Our Lord, the Transfiguration and the Crucifixion which leads to the Resurrection. These represent stages on the spiritual path at an earthly level, which are intertwined at some level with people’s activities and intentions. The fifth festival, the Ascension, is more concerned with experience and intentions at a higher spiritual level, which is none the less still accessible to us all in due course. Each festival has its period of preparation. Our Founding Bishops structured these periods using Intents, or Precepts, linked to each of the Sundays of preparation. We are also encouraged to use these precepts during the week days for individual prayer and meditation. The Epistles and Gospels selected by the Founding Bishops to accompany these intents provide a rich context for gentle exploration in our daily meditations. I will conclude by wishing you all a very happy and safe Christmas as we gather together again with friends and families. Enjoying the very real pleasure of such human interactions at this time brings great refreshment for us all. I look forward to seeing you at our Advent services this month, at the Carol Service at 6pm on Christmas Eve and at the service on Christmas Day. 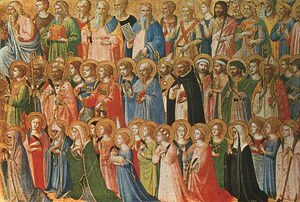 The liturgical season of All Saints and All Souls at the start of the month of November is one of the most significant times in the church year. The important celebrations at this time bring into focus some very important understandings for Liberal Catholics. The first is the understanding of the part that Saints can play in our lives and the second is the continuity of life. The three days, 31 October and 1 and 2 November, represent “Allhallowtide”. The period begins at sunset on 31 October, known to us these days as Halloween. The word Hallowe’en is “holy evening” or “(All) Hallow(s) E(ve)en”. In Celtic traditions, on this evening right at the end of autumn and the harvest season, before the start of the darker wintertime, spirits and related entities roam free after sunset. Then the Saints re-establish spiritual order in the world on All Hallows’ Day, the day we call All Saints’ Day. In Celtic (and many other) traditions this particular evening at the end of Autumn was also the evening when the souls of the dead returned home and were appeased with offerings of food and drink. In the Christian tradition this is a time for honouring the Saints and praying for departed souls. In past newsletters I have talked about the misunderstandings about the Saints being regarded as intercessors for us when we seek closer connection to God (or the Trinity). We need no such intercessors since the strength, love and support from the Trinity is closer than our breath; it permeates our core being. The question for us all is how can we effectively access this critical source of strength and inspiration in the midst of all the hurly burly of our daily lives. Part of the answer is to interact with the Saints. The Saints have been recognised because of their extraordinary lives and examples. They have gone ahead of us, developing practices, attitudes and lifestyles that have shown us direct and accessible paths for us to follow towards finding God, or the Trinity. As a result of their dedicated personal development on earth, the Saints in their spiritual nature can help us gain access to the constantly available Prime Source that is God. In the Liberal Catholic Church we have an understanding that we are clothed in many “bodies”, which in 21st century language we can nominate as our feelings, our intellect, our spiritual responses to uplifting experiences, and so on. These “bodies” have different states of awareness, different levels of consciousness. Other spiritual traditions have various names for these states of awareness. 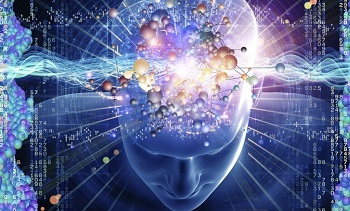 Members of our church too have explored those levels of consciousness which have the characteristic of increasing our levels and scope of awareness of every aspect of “Life” in the Cosmos, including up to the Trinity. These phrases capture the essence of the higher states of consciousness. As Liberal Catholics we have the opportunity to explore the Traditional Wisdom which links the concept of an individual’s “spirit, soul, bodies” to the concept of the continuity of life. This is the focus of the celebration of All Souls’ Day where we recall all those who have departed from us. The key and central part of this commemoration is not to engender sadness or sentimental feelings of loss but, on the contrary, to send and direct as forcefully and with as much love as we can thoughts and aspirations of encouragement to support all the departed souls. This is based on our Liberal Catholic view of the continuity of life. Although our loved ones are no longer visible, we expect that they are sill journeying on their own path. Just as we ask the Saints for love and assistance on our paths in the midst of our daily lives, so too can we all participate in a similar process of linking with and assisting those no longer visibly with us but still continuing their existence. 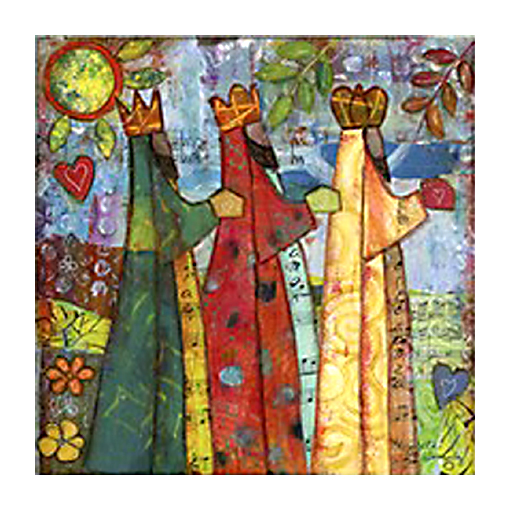 The month of November also sees the conclusion of the cycle of Trinity Sundays with the final intents of Perseverance, Right Energy and Precept and Practice. 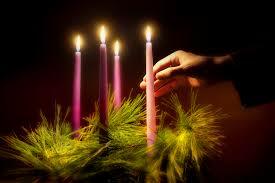 The fourth Sunday is the “Sunday Next Before Advent”, which reminds us all, again, that time hurries by. The month of October commemorates two Archangels, St Michael and St Raphael and we also have Trinity Sundays from the 16th to the 20th. 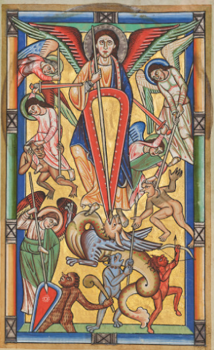 The first Sunday in October lies within the Octave of St Michael and All Angels. 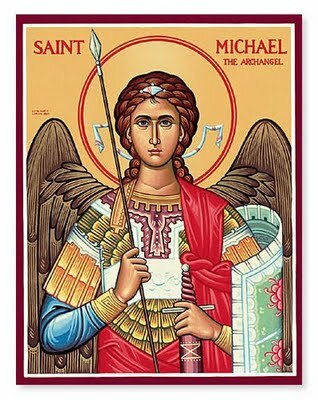 St Michael is the Patron Saint of our Liberal Catholic Church in Southport. As Liberal Catholics we appreciate that we need no “intercessors” to link with the Christ at the core of our being at any time. The function and purpose of a Patron of a church (a Saint or an Archangel) is to create a dedicated channel by which we can call on the Patron’s support, direction and inspiration. With regular use and appropriate mindfulness, our linking with our Patron becomes a potent means of helping us to make our lives meaningful and useful. 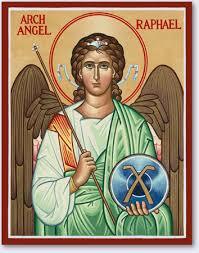 St Raphael (or Archangel Raphael) is commemorated on the 24th October. 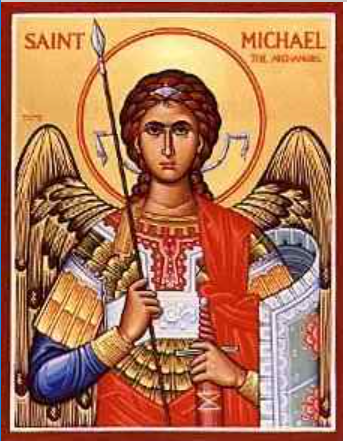 This Archangel is known to us as the Healing Archangel who is invoked in the Healing Service. In the liturgy for the healing service, we have the words “ - - - and invoking the help of the holy Archangel Raphael, I anoint thee with oil, - - -“ (“I” being the Celebrant). Both the Rev. Geoffrey Hodson and Bp Leadbeater have written extensively about the benefits of consciously invoking and working with Angels in all their forms. Such work is a very real part of the culture and heritage of the Liberal Catholic Church throughout the world. The intents of the five Trinity Sundays are, sequentially, Justice, Spiritual progress, Christ as Truth, Tact and Tolerance and Serenity. On my recent short visit to Geneva in Switzerland, I noticed very prominent public scultures serving as reminders of the plight of refugees worldwide. ethnic mixture of the population of Geneva was also very prominent, the conservative business attire that might be expected in a Swiss city contrasting with the vivid colours and styles from African and other countries from all over the planet. practice of Tact and Tolerance would have to be a by-word for the residents of Geneva. The topic of Justice always generates lively and sometimes heated discussions, with people contrasting what they see in their daily lives, on the TV news, for example, with what they consider to be “justice”. As Liberal Catholics we can enjoy the freedom of interpreting the scriptures, the Creeds and liturgy in a way that is most meaningful to ourselves, while respecting the viewpoints of our fellow worshippers and participants. I find it useful to reflect on a portion of the wording of the Act of Faith that we use in our Eucharist, which reads, “We believe - - - that perfect justice rules the world - - -“. This phrase from the Creed indicates to me that we should take the long view of justice in this world, extending sometimes over many lifetimes. I know that for some this is unacceptable, and that all the “black hats” need to be brought to justice as soon as possible! But, on reflection, I think we can see that the practical logistics of such a demand are beyond the ability of many parts of the world, politically, culturally, economically and historically. With the help of the five Intents of October from Justice through to Serenity, we can use them to develop our inner resilience and we can strive to interact with all whom we meet in our daily lives with tact and tolerance. With such a personal practice we might then become aware of our own spiritual progress as we hold the concept of “Christ as Truth” in our hearts. The month of September in our LCC church calendar starts on the 12th Sunday after Trinity with the intent of “Self-Dedication”. This intent is a very useful reminder for us all to revisit, preferably daily, our personal intents that form the basis and direction of our daily activities and experiences. The “self-dedication” part of such a personal daily practice can be as simple and as straightforward as saying to ourselves, “In the name of the Father and of the Son and of the Holy Ghost” on first awakening, which helps to align our actions for the day. The second Sunday in September is within the Octave of the Nativity of our Lady. 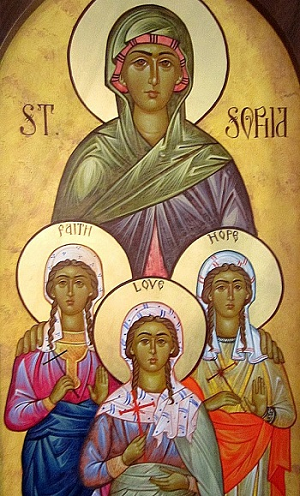 This festival links with the symbolic personal spiritual journey of Our Lady that we have been following through July and August, and also links through to the festival of Sancta Sophia (Holy Wisdom) celebrated on the third Sunday of September. The theme of Holy or Divine Wisdom is very much the hallmark of Our Lady and a shared characteristic of our Lord Christ. The fourth Sunday in September brings us to the 15th Sunday after Trinity with the intent, “the Reality of Things Eternal”. 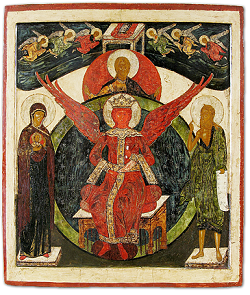 This is designated as a (red) day of devotion to the Holy Spirit, and reminds us that although we may struggle at times with making a meaningful personal engagement with festivals such as the Nativity of Our Lady or Sancta Sophia, the underpinning themes and inner narratives are, actually, “the Reality of Things Eternal”. For myself, linking the themes and narratives of festivals is a way of visualising myself being on a spiritual path, in the Christian tradition. The last Thursday of September celebrates the festival of Saint Michael and All Angels, which has a special significance for us at Southport! Our Patron Saint is “St Michael and All Angels” and we will celebrate this festival in the Eucharist of the 1st Sunday of October. 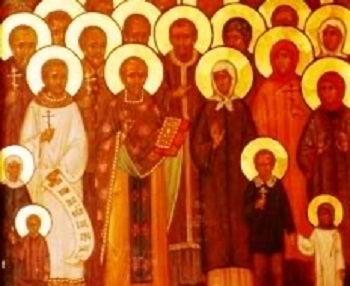 Patron Saints of churches play a very important role in the spiritual life of the Church and in the daily lives of every member of that Church. The Grace of God is at an energy level well above the physical and we try to tune into that as best we can. A Patron Saint is more progressed along the spiritual path than we are and can act as our channel to God’s grace. Our Patron Saint, St Michael, can be called upon for inspiration, guidance and advice when we are open to receiving them. 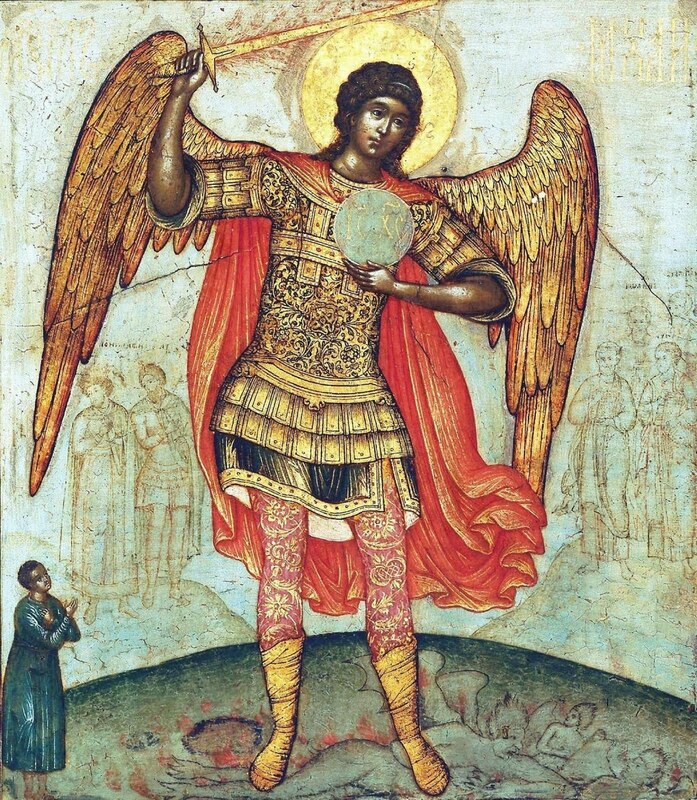 By meditation and prayer in a directed way to St Michael we create the opportunity for our hearts and minds to be open to God’s grace, directed to and through ourselves, with the special “flavour” of St Michael. On 14 September I will travel to Geneva for a week-long conference and then on to London to visit my son and his family. In Geneva I hope to attend Holy Eucharist at the Old Catholic Church. The Old Catholic Church in Switzerland, as with a number of churches in the “Catholic” tradition, broke from Rome in the 19th century in disagreement with the Roman Catholic dogma of papal infallibility. While I am away Archbishop Graham Preston will celebrate at St Michaels on Sunday 17 September. 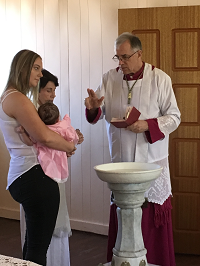 On Sunday 20 August I had the pleasure of baptising Charli-Rose Marie Sandling at St Michael’s. The four Sundays in August, starting with the 8th Sunday after Trinity on the 6th August, have the intents Wisdom, Confidence, Devotion and Discernment. The Sundays of Trinity with their respective Intents have linked Epistles and Gospels and Collects which, together, provide us with a rich source of content for reading, assimilation, reflection and meditation. Following such an inner journey, which invariably is accompanied by some reconstruction of our world view(! ), we can put these “tools of perception” into action in our daily lives. If we consequently experience some ongoing adjustments and refinements to our thoughts and actions, we know that this is a good sign that progress is being made. This morning (6 August) we discussed “Wisdom”, which is the first of the Intents for August. During our discussion associated with the sermon, questions from the Eucharist participants ranged through “What is the difference between knowledge (eg collected as Big Data) and genuine Wisdom?”, “Where does Wisdom arise from?”, “How do we develop Wisdom?”, and “How do we discern that we are growing in and with Wisdom?”. 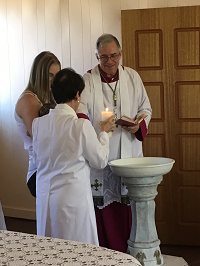 All participants in LCC liturgical services have the opportunity to explore and express their personal views of the Intents, while experiencing and working with the Celebrant in the service as “co-creators with God”. What a privilege this is, what an opportunity for personal growth, and a gift, both for us and the communities we interact with. This year the Festival is celebrated on the 15th August, with Sunday 20th falling within its octave. 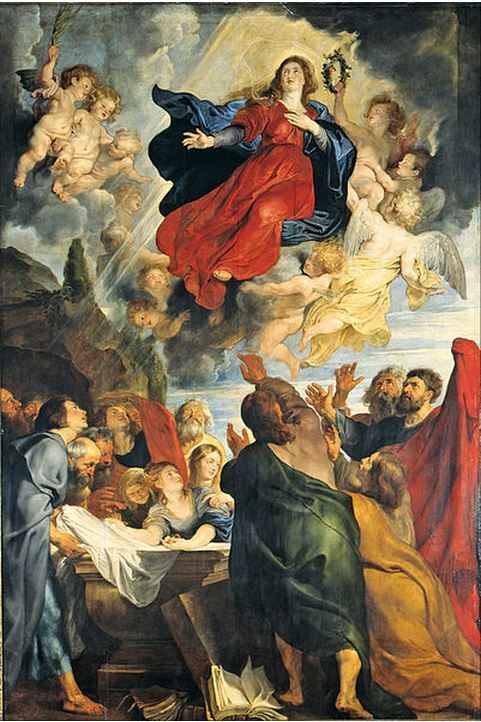 The Assumption, celebrates the conclusion of Mother Mary’s human existence on earth. 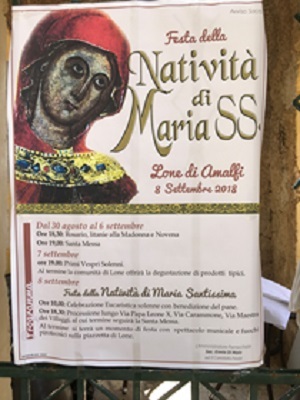 For some, perhaps, this Festival, where Mary’s body ascends into heaven, presents some theological, scientific and materialistic challenges. With most Festivals of this nature it is always wise to look to the deeper truths of the symbolism. 3. The feminine aspect of the Deity. As Bishop Leadbeater points out in this section, Christianity historically comes from the Middle East, where a poetic form of expressing deep truths is an accepted medium for reaching personal understanding. I have personally found such means to be very effective. The lyricism, form and content of poetry can bypass the rational mind and plant seeds of future growth leading to well-founded rational beliefs. Taking the perspective at a human level of Mary as a mother contemplating the crucifixion of her son, Jesus, we can imagine the incredible pain and anguish that she experiences. As captured by artists, Mary looks through and beyond this human tragedy to the deeper picture. 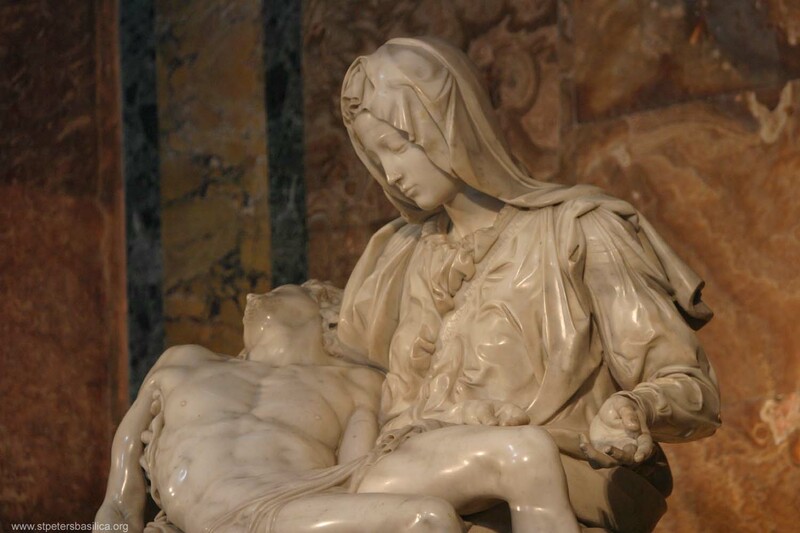 The “Pieta” by Michelangelo captures the human/divine moment in a sublime way. “And a woman spoke, saying, Tell us of Pain. And he said: Your pain is the breaking of the shell that encloses your understanding. Even as the stone of the fruit must break, that its heart may stand in the sun, so must you know pain. On the last weekend in July, Archbishop Graham and I were in Perth to honour the 50 years of service to the Liberal Catholic Church of Bishop James and to commemorate his retirement. The celebration of Bishop James’s achievements were a highlight of the weekend, and although such milestones are always tinged with some regret as one role is exchanged for another, everyone present there in Perth and LCC members around the world wish James a very happy and fulfilled retirement.